The latest Good Beach Guide (2009) by the Marine Conservation Society (MCS) shows Anglesey beaches doing very well again in bathing quality ratings. Bathing water tests which formed the basis of the latest Good Beach Guide recommendations were carried out between May and September 2008. 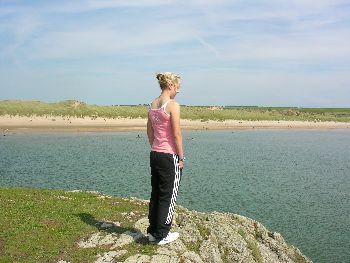 In all 17 beaches in Anglesey were tested and the guide shows how the quality has changed between 2007 and 2008. Five beaches got a Basic Pass in 2007, which means that the beach has passed the Mandatory EC water quality standard only, a statutory minimum. These beaches were Red Wharf Bay, Porth Eilian in Amlwch, Cemaes and Cemaes Traeth Bach, and Porth Trwyn, and of these only Porth Trwyn and Red Wharf Bay improved to Recommended status for 2008. A beach only receives "Recommended" status when it has the highest water quality standard and good treatment of continuous sewage discharges. Beaumaris, Lleiniog Beach Penmon, Llanddona, St David's Beach near Benllech, Benllech Beach, beaches at Lligwy, Cemlyn, Church Bay, Porth Tywyn Mawr (Sandy Beach), Porth Dafarch and Trearddur Bay. See a map of Anglesey here. Only one beach, Moelfre, dropped from Recommended status in 2007 to a Basic pass in 2008, and so overall this was a very satisfactory result for the island's beaches. The top status is Recommended and this is followed by Guideline, which means it is good water quality standard only. Basic Pass is a statutory minimum, while Failed means that the beach fails the mandatory EC standard for water. A key impact on the results this year was Britain experiencing the seventh wettest summer on record. In some areas this led to higher amounts of pollution, like raw sewerage and farm waste, being washed into rivers and seas. Figures show the MCS is now recommending 25% fewer beaches than just three years ago. Given the impact of climate change on weather patterns there is a growing view that more infrastructure investment is needed to cope with coastal pollution caused by storms and heavier rainfall. The above figures should give visitors to the island confidence that they can enjoy their swim or boating activities on their favourite Anglesey beach. For more information, news and articles on the island, subscribe to our free Anglesey Today Newsletter here. It's as easy as 1-2-3! Well the guide of Anglesey Beach Guide is absolutely brilliant thing through this guide we can visit this beach and have a pictures on the historical places. I have always thought about creating such a beach guide for my state too, as we have a lot of beaches. Among those, some are so popular and there are some less known to the tourists but are better than the rest in many ways. we were on Sandy beach on Saturday, a great location, nice sunset for when we had our barbecue. thanks for this information on water quality.